Ray Stevens at his home in Berkeley, CA. Photo by John Noltner. Ray Stevens knew from a young age that his future didn’t lie in the rice fields of Louisiana. 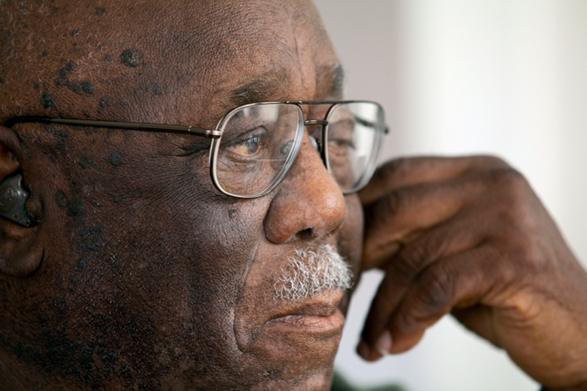 He joined the Navy as a teenager, but found the military to be rigidly segregated. “You had to refer to all white people as Mister,” he says. “I didn’t like that either. There was some rebellion going on among the blacks in the Navy in World War II. I got close the radicals, which attracted me as a young man. They discharged all 150 of us in one day.” Afterward, he moved to Michigan to work in automobile manufacturing. When he returned to Lake Charles for a family visit in 1944, a racist police officer chased him out of town. Stevens caught a train to Oakland and has lived in the Bay Area ever since. He worked at the Naval Supply Center for 35 years.